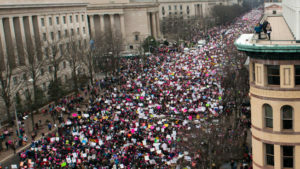 A wide scale shot of demonstrators marching on Pennsylvania Avenue during the Women’s March in Washington D.C. on January 21, 2017. 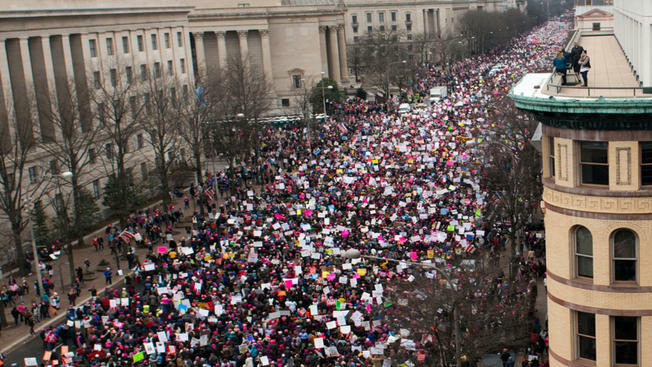 The organizers of the Women’s March on Washington are making plans for another open strike where women take a day off for “A Day Without A Woman” boycott. Wednesday, March 8 is International Women’s Day and boycott organizers are calling for a one-day strike around the world. This shall spotlight the indispensable role women play in society, they said in a statement.Organizers are hoping those who are looking to participate take the day off from paid and unpaid labor. Only spend money at small, women- and minority-owned businesses. They ask everybody wear red, a color that represents revolutionary love and sacrifice. The organizer are hoping to send a powerful message to corporate America and in particular the awful Donald Trump. Organizers hope to draw and garner the same attention that the “Day without immigrants” march on February 16th had. Many D.C. restaurants closed down that day to honor that march and organizers for this march hope for the same result. Organizers want male participation by calling government and workplace decision-makers to extend equal pay and adequate paid leave for women. Also for businesses close for the day or give female workers the day off. Finally to give caregivers, nannies and housekeepers a granted paid day off. Finally organizers also said the day acknowledges that transgender and gender nonconforming people. As well as women with disabilities, face heightened levels of discrimination, social oppression and political targeting. Their hope for unity between people of all genders, races, and religions. organizers want them to show how much we adore our wives, mothers, girlfriends, sisters, and kin. They really mean a lot to society. It’s a good cause that needs more support from not just the DMV area but all around the world. protesters are encouraging women to NOT going to work! this is as ignorant as #adaywioutimmigrants. This is an embarrassment to the 19th ammendment. our foremothers worked hard for this amendment so that they can have job- Any job- and now that we have these rights, we have these jobs; #adaywithoutwomen want you to not go to work not go to school. people were fired on #aday withoutimmigrants. WHY? because of all work place rules – if you dont show up for ur job your fired. plain and simple. it doesnt make a differance if your male, female, young or old, black/white/brown or yellow- company rules are rules. it is rediculas to me that the gratest generation won women rights to school, jobs and growth and the way that is being displayed is: dont go to work?? bery ignorant. the way to honor are foremothers IS TO GO TO WORK! the only message this is sending is disrespect to not only your employer but also your coworkers. this doesnt sound like an “equallity” movement, its much more like “we want special” treatment. fighting and protesting for equallity(witch we are equal) but by ditching work for #adaywithoutwomen just showes that your not an equal player in the game. it sets women back 100 years! if your lucky enough to have employment, you should be thankful and show up! !